Project Linus is the recipient of our next Meaningful Giving Collection. Project Linus is a program that donates homemade blankets, made with love, to hospitalized and traumatized children. 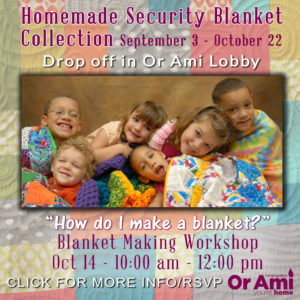 Our goal is to collect 75 blankets created by our very own Or Ami “blanketeers…” Won’t you take part in this beautiful act of tikkun olam? Don’t know how to sew?